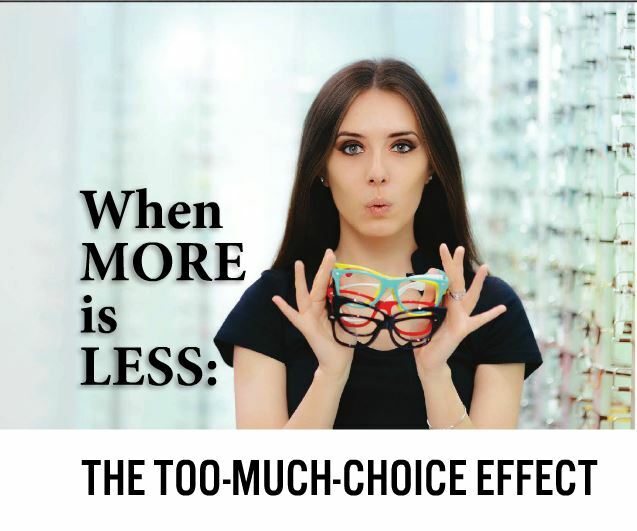 Optical retailers recognize that customers crave choice, perhaps even abundance. Research from various sources, including marketers, economists and psychologists supports the belief that shoppers feel they benefit from having more choice. Online giants like Amazon have indeed built their business models on the ability to offer endless assortments in any product category. But did you know there is a well-documented “too much choice” effect? It’s also known as “choice overload”, “the paradox of choice”, or “hyperchoice”. Further investigation has shown that having too much choice can be associated with less purchasing! Offering consumers too many options makes them less keen to make a final choice. How many of us have been overwhelmed by our options when shopping online for cosmetics or electronics, for example, and have simply put off the decision and abandoned our carts? Perhaps even more surprisingly—and more importantly for ECPs—when there are too many options, customers have less post-purchase satisfaction with their choice. What causes this lower satisfaction? Having to decline many alternatives. The more alternatives customers have, the more uncertain they may feel about whether they have made a good choice. The most important thing is to make the range of choices seem less complicated to the consumer. When presenting frames start with options that are quite dissimilar. Present choices in a specific order, from the boldest to most subtle frame designs, from the most advanced design to entry-level options in lenses. Propose a frame or lens that you can describe as a standout option and offer one back-up option for easy comparison. Offering one choice that is clearly superior will help reduce the choice paralysis your customer may be feeling. The size of the assortment matters differently to two distinct types of customer. For customers who don’t arrive with something specific in mind, more IS less, whereas customers who walk in with strong preferences tend to be more satisfied if they choose from a larger assortment, expecting that a large selection will ensure they find the look or the product they have in mind. You can be successful with both types of customers if you merchandise your frame selection strategically. Place more of the “same” items together: multiple colours of the same frame, the same sunglass style with and without polarized lenses. This will avoid triggering the “too much choice” effect. Mirrors, false bottoms and simply presenting every product twice on a frame board can go a long way to creating the comfort of selection without the discomfort of choice paralysis. We owe our customers the necessary technical information, so they can participate actively in the selection process and make well-informed choices, but the difficulty of choosing will increase with the number of different pieces of information they need to evaluate. This is particularly true when consumers lack expertise and experience­­—particularly when they are first-time wearers of prescription glasses, progressive lenses or contact lenses. The secret to avoiding information overload is to simplify the choices by grouping them in categories. For example, if you tell customers, “we will walk through three decisions together with respect to your lens options—lens material, lens design and lens coatings”—it will be less overwhelming than if you had listed all the options one-by-one. Same for frame choices: saying, “let’s compare the benefits of the different materials, then choose a shape, then your colour preference,” helps reduce the complexity. This approach has proven to be even more effective with smaller rather than larger assortments. Always keep in mind that your customer’s ultimate satisfaction is not directly associated with the number of choices you offer. The relationship between choice and satisfaction is complicated and sometimes too many choices can damage your overall effectiveness.